This bag has an unmatched warmth/weight ratio. Like System 1 this system is a serious weight-saver. Wearing the Xero clothing inside the Hispar 600 moves the performance rating right up to -47°C (the bag in the system is the Wide version to make sure that the down clothing can loft fully). Yet the Hispar bag weighs around 600g (21.2oz) less than a standard bag rated to -47°C and packs down to about two-thirds the volume. The Hispar 600K has even more impressive stats. K Series: The Hispar 600K Down Sleeping Bag (Wide) is available in the K Series. The exceptional loft of 1000 down reduces the weight to just 982g (34.6oz), creating a unique sleeping bag that still fulfils its -21°C rating at under a kilo pack weight. 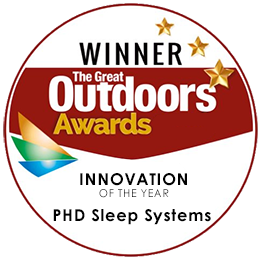 This system is very similar to the one already used successfully on Broad Peak (see Case Study), but it advises a much warmer sleeping bag. The Hispar 600 only weighs a little over 200g (7.1oz) more than the bag used on Broad Peak, but it gives a greatly increased margin for mishap or bad weather, a necessary precaution on Denali. As climbing kit, the Xero clothing is rated for -40°C (-40°F), and the night-time boost it gives the Hispar bag takes the system rating up to -47°C, the same as System 1 with the Xero Suit. The main difference is that the clothing in this system is in separate pieces. While the one-piece suit is simpler and often favoured for the highest peaks, separate clothing makes for a little more versatility and wider usefulness for the kit on trips to lower mountains. "This bag has an unmatched warmth/weight ratio ... The draft tubes undoubtedly provide the best insulation behind the zip of all the bags tested – not a trivial detail if you face harsh conditions." "Peter Hutchinson makes probably the best down gear in the world and his Xero jacket has kept me happy (well as much as you can expect to be) deep into the minus 40 degrees." — Nick Lewis, Climb Magazine. "The Xero booties were great for sleeping in and I could also wear them inside my Sportivas for mooching around camp. All in all, perfect." — Nick Lewis, Adventure Network International.